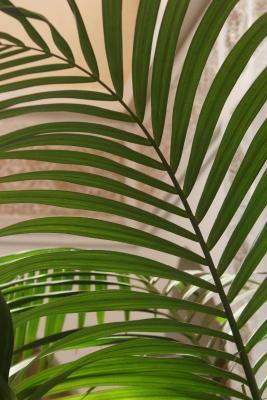 Riad decor was lovely! Staff are friendly and helpful. We only stayed one night - unfortunatelly! Before, we went to Sahara and Atlas, so we needed a nice rest before moving on to Agadir the next day. Our room was quite romantic, loved the design of a hotel as such. 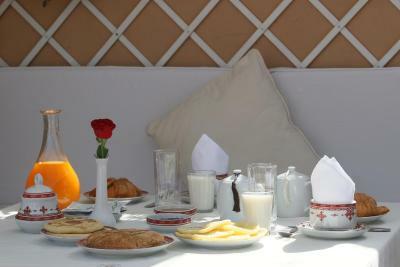 Breakfast was nice, as often in Morocco rather sweet than savoury. 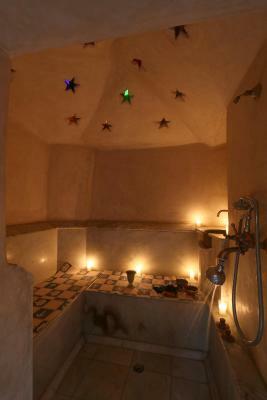 What we loved the most was a private hammam and massage - I felt like a newborn. 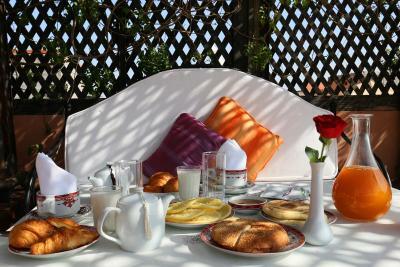 A royal breakfast, wonderful decorations, clean and very romantic suite! Living room was great! And staff who helped us checking in and out was so helpful and kind. 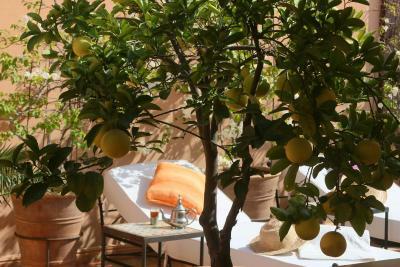 Upon Arrival Jalil was very welcoming, Our room was perfect and the riad itself is stunning. 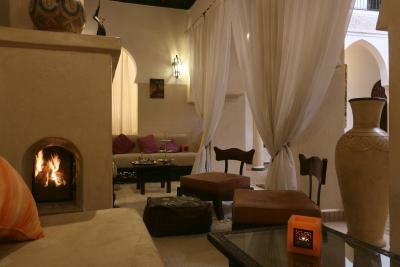 When the gate of the riad opens you enter a relaxing place! also a big thankyou to Fatima for the excellent couscous and tajine! 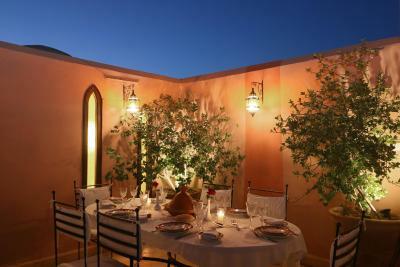 Very nicely decorated riad and terrace. Hammam for 15Euros was really good. We were able to purchase some Moroccan wine. Staff organized taxi for us. Just beautiful.Everytime again! Highly recommended. Not far from the El Fna plaza (15/20min walk) and close to one of the Medina's exit. This allows you to be enough close to everything but still far from the confusion. Check in was smooth and bedroom comfortable. The swimming pool is nice and the breakfast ok. Overall a positive experience. 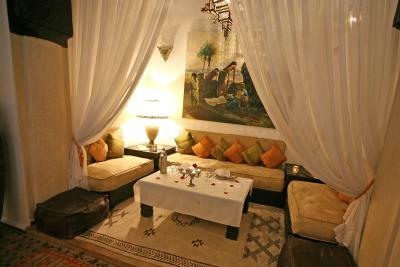 This traditional Moroccan guest house is in Marrakesh’s Medina district, a short walk from Jamaâ El Fna Square. 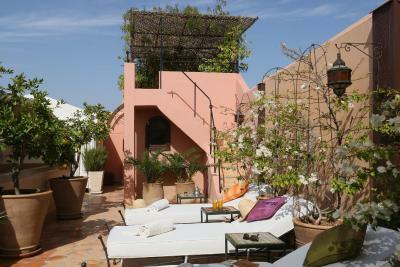 It has a rooftop terrace with panoramic views of the Atlas Mountains. 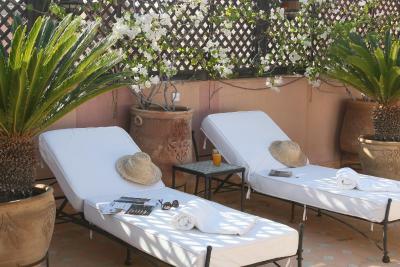 At the Andalouse guests can relax on the interior patio, which features a plunge-pool and a alounge area. 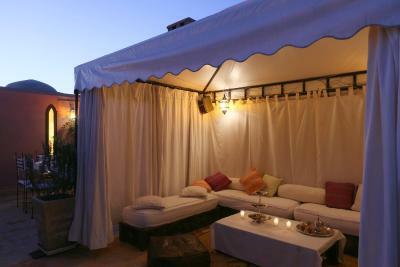 There is also a hammam, and massage treatments are available. 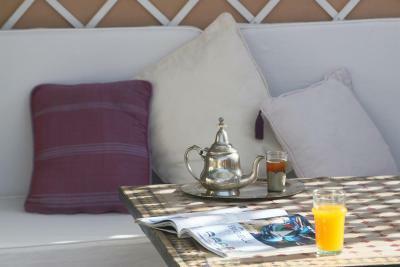 Riad Andalouse offers air-conditioned rooms and suites with characteristic Moroccan features and private bathrooms. Free Wi-Fi access is available in all rooms. 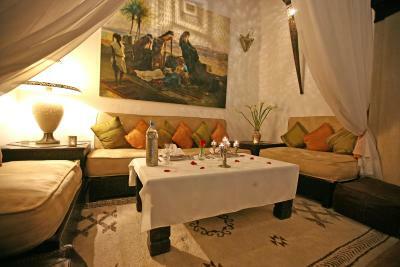 The riad serves characteristic Moroccan cuisine and guests can enjoy a drink in the private bar. Additional facilities include a 24-hour reception and a tour desk. 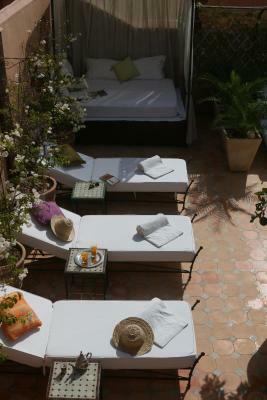 Unlike many guest houses in Marrakesh, the Riad Andalouse has direct car access. Both the Royal Golf and the Golf Amelkis golf courses are a 10-minute drive away. 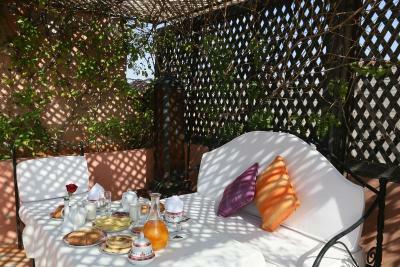 When would you like to stay at Riad Andalouse? This twin/double room features a bathrobe, seating area and patio. This suite features a seating area, air conditioning and tile/marble floor. This suite has a bathrobe, patio and air conditioning. House Rules Riad Andalouse takes special requests – add in the next step! Riad Andalouse accepts these cards and reserves the right to temporarily hold an amount prior to arrival. Please note that there is an extra fee of 3.5% for a payment by credit card. Was told we were unable to pay by credit card despite being assured the day before that this wasn’t a problem (apparently not working for 2 months - but they were able to fix it for check out). Because of the style of door and knocker on the door it was very loud. You can hear everyone coming home at every point during the night. No real seperation between bedroom and bathroom only a curtain (which means you can hear everything). WiFi didn’t work for us. I have to say that I did not like the neighbourhood very much. Sometimes we accidentaly turned into the part where we did not feel very safe or welcomed. Riad was very nice and employees were friendly . There were so many bugs. And foods were not that good. The Riad itself is as shown um the pictutes. Of course you cannot expect a tv or a bathroom door. But two broken lamps that were not replaced during my stay and the awful drain smell were a bonus. Also it is a terrible neighborhood, I felt afraid for my security. And finally, although it says that you can pay the extras (like the airport shuttle) with credit card, I found that the only option was to pay in cash (and they had no Change!!). The Riad itself is as shown um the pictutes. The room was bit simple, and bathroom had specific smell. It was clean, but one morning we found big cockroach on the floor. Not very touristic area, and not accurate location on Booking map. Pool was very cold. The house was a little noisy, can hear everyone coming in and out. It was also a little cold, could have done with putting the fire on. I would not recommend this for a stay. It is 20 a 30 min walk to the medina. Please do not let the riad book any excursion for you, they make you pay double prizes. Look for travel agencies in the Centre, and you will find affordable prizes. If you want to take a cab, just make sure you organize one for yourself. Don't let them pay you 150 dirham to go anywhere in Marrakech. Just hold a cab for yourself on the streets and make sure you don't pay more than 50 Dirham. I was very disappointed in how the riad is treating their guests , and making them pay too much for everything! The riad is/looksBeautiful and clean. There are some things that could make the experience more pleasant. The guy from the reception sleeps on a bank just located in the front of the bedrooms windows; there is a removable roof on the top of the riad that does not allow the sun to shine downstairs and/or in the swimming pool; their excursions are overpriced. There were also some technical problems with the room was the lock was broken and the toilet light was failing, but anyway those are punctual accidents.